Even with the Coolmore Lexington Stakes (gr. II) completed, we still don’t have a firm field. A starting berth in the Derby is in such high demand, The Cliff’s Edge Derby Trial Stakes (gr. III) has now become a final last gasp for those with a bad case of Derby fever. 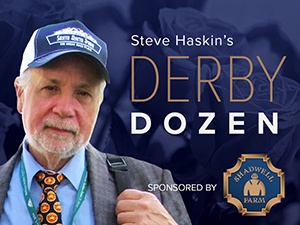 One of those who has been stricken is Ken Ramsey, who, refreshingly, admits he has Derby fever in the worst way. And it has to be frustrating for him to have a closer who was beaten a nose in the Florida Derby (gr. I) and can’t find his way into the Derby. So, instead of going into the Derby with no races in six weeks, as originally planned, the Derby would be Pleasant Prince’s third race in three weeks. And you know what? More power to Ramsey, who already has Dean’s Kitten in the field, for doing everything possible to get there with this colt, especially considering his attempt in the Toyota Blue Grass (gr. I), although futile, likely took little or nothing out of the horse. The exclusive BloodHorse.com special report, Triple Crown 2010 Pedigree Profiles & Sire Analysis, will help you identify the pedigrees with the greatest potential to win each leg of the Triple Crown. Order now! In an era of conservative training, wouldn’t it be nice to have a poster child for good old-fashioned racing when horses routinely ran every two to three weeks, and even running back in one week was nothing unusual. Ben Jones used to run all his big Calumet horses in the Derby Trial when it was only four days before the Derby and then worked them a half-mile two days before the Derby. The Blue Grass Stakes was at its most productive when it was run nine days before the Derby. Whether or not Pleasant Prince wins the Derby Trial, and he has to win to get into the Kentucky Derby, at least Ramsey is taking his best shot with a horse who deserves to be in the race, and he’s honest enough to admit he is badly infected with Derby fever and covets that blanket of roses more than the Dubai World Cup and Breeders’ Cup trophies he’s already won. He towers above the others in dominance and speed figures, and his negative 3 1/2 on Thoro-Graph puts him well above everyone else. But the last horse to romp by such big margins in his final two preps was Spend a Buck 25 years ago. He doesn’t even need to move forward, just maintain where he is. If he wins the Derby, you can bet Triple Crown sweep talk will be hot and heavy. I’m liking him more every day. He had his first spin over the Churchill surface, breezing 5 furlongs in 1:01 1/5. He has an incredible mind, which you want for the Derby, and you won’t find a more professional racehorse. If he has a chance to win, he’ll find a way to do it. If he didn’t finish out of the money in the BC Juvenile, Rebel, and SA Derby, with all the trouble he had, he may never finish out of the money. And unlike most of the others, the Derby has been on Baffert’s mind with this colt since last summer. Putting him back to #3 after his excellent 5f work in :59 4/5, in which he sat off his workmate, then galloped out strong in 1:12 4/5. This work was just what you wanted to see. He settles so well, he should rate off the lead. If he does settle and can come home like he’s done in his three previous races he will be tough. The way Pro-Ride horses have performed on dirt, it’s not even worth bringing up that subject. Moving him up as well after breezing a bullet 5f in :59 1/5 at Churchill, fastest of 44 works. At least we know he loves the track. He is one of the few horses who can put in a long sustained run, but he hasn’t been able to finish it off. What he needs to do is take way back and launch that move from well off the pace in order to save more for the end. He doesn’t have a turn of foot and is more of a grinder, so his best shot is to sit back and pick off horses one by one. He is consistently fast in his Thoro-Graph numbers and he has the fastest 2-year-old figure to fall back on. I just would like to have seen him settle better in his work and gallop out stronger. The last you want from him now is early speed. I also moved him up after his most recent work, although I wish it had been at Churchill instead of Keeneland. But it definitely was a “Derby” work. Only having four starts is a slight concern, but his potential is unlimited and he is improving rapidly. Loved his :22 4/5 middle split, his “gallop” out in :12 2/5, and most of all pulling up another eighth in :13 2/5 for a 1:25 2/5 7f clocking, while blowing away his workmate by 10 lengths. That would have been a terrific 7f work, but pulling up in that time was extremely impressive. Maybe coming back to a much lower altitude (from 3,700 feet) can be a factor. He is one of the few horses who had a legitimate excuse in his last start, losing a shoe coming out of the gate. He possesses the quickest turn of foot of anyone in the race, but it must be timed to perfection and he can’t be given too much to do too early. He is on a good pattern and should be flying at the end with a perfect trip. Julien Leparoux is the perfect rider for him and knows him pretty well by now. All logic says to ignore the Blue Grass; there is no reason why this colt all of a sudden has gone from mediocre allowance horse to Derby contender. But, visually, I can’t help but be impressed with what I saw. I just love the way he was striding out at the wire, and any horse who runs as well as he did on two occasions at Saratoga, on dirt and grass, has got to be legitimate. Other than his allowance at Churchill, after which he was very ill, and his return race after a three-month absence, he hasn’t shown any indication he won’t run well on dirt. As one can see I’m not really sure where to put him. He shied from the whip three times in the stretch of the Arkansas Derby, which might have cost him the victory. But it was only his second start of the year, so he should move forward. But his running style is not ideal in this year’s speed-heavy Derby, and of the four WinStar horses and however many Pletcher horses, he has always been the one considered the least likely to rate. But I still think the Arkansas Derby will move him forward; just the tightener he needed. Being away for six weeks has sort of put him in the background, and you don’t hear too many people talking about him. The truth is, we really don’t know much about him, except he’s the one true deep closer in the field. And if there is a pace meltdown, which is entirely possible, he is one you can rely on to come late and pick up the pieces. Stablemate Jackson Bend is a tough little fighter and if he gets in he will make sure the stalkers are preoccupied for as long as possible. His Beyer Speed Figures and Thoro-Graph numbers say he’s not fast enough, but he still intrigues me. He basically runs the same race every time, but he seems to be maturing with every race and I can’t help but think he has a big effort in him. I just like what I see when I watch him run. It’s as if he’s lurking in the shadows, waiting to surprise a lot of people. He could be an interesting horse to fill out a juicy trifecta or superfecta. He has little shot running the same way he did in his last two races, but he has shown on three occasions he can come from far back and turn it on in the stretch. If he returns to that style and handles the dirt he could be a real sleeper. His Palm Beach was a 6 1/2-point improvement on Thoro-Graph, yet he improved off it in the Blue Grass, moving up 2 1/4 more points. Who knows how much more he can improve in the Derby if he can use his pedigree and closing punch. Frankly, I was surprised to see he received a negative Thoro-Graph number in the Illinois Derby, one of only two negative figs this year, making that race faster than one might have thought. That race was set up for him, it wasn’t a strong field, and he’s yet another horse with a ton of speed, but you never know when those Tiznows are going to break out. I don’t like putting “doubtful” horses on here at this late date. But with Setsuko unlikely to get in, why wouldn’t his owners give him one shot to show what he can do on dirt, making one big late run from the back? They have nothing to lose. In the Blue Grass, he again was mistakenly hustled out of the gate and still ran a good race, despite never looking comfortable on that track and going very wide on both turns. Finally, the dirt beckons; go for it. If he does, he moves back up in the top 5. I’m sure not going to give up on him now.